Our theme this month is Colouring and I have chosen to use a combination of Brusho Crystal Colour and Stampin' Blends alcohol markers. It was an experiment that I wasn't sure was going to work but I'm quite happy with the outcome! I cut a piece of the Just Add Color paper for my background and sprinkled on some yellow and blue Brusho powder. I then spritzed it liberally with water, gave it a couple of swishes with a large damp brush and then left it to do its thing. 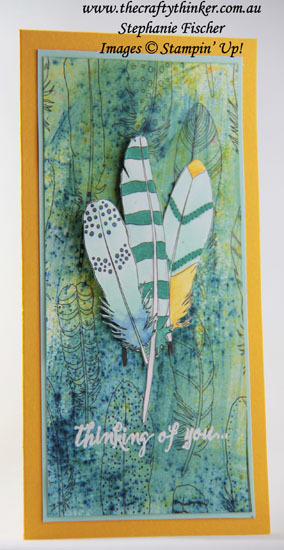 While the background was drying, I used the Stampin' Blends to colour some feathers from another piece of the Just Add Color paper and then fussy cut them. 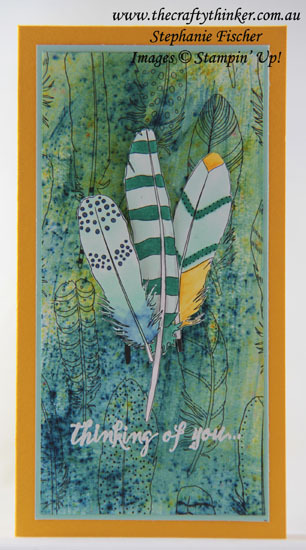 When applying the feathers to the card, I put some glue on the quill ends and added some mini Stampin' Dimensionals to the tops to provide some depth and interest.